I have a fig tree in my garden. This tree has been planted by the previous tenants of the house I now live in. 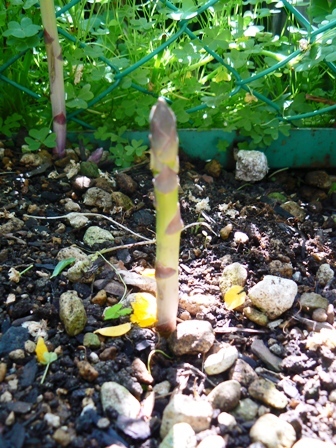 If you are a follower of my blog, you might remember reading about asparagus growing in my garden. Just like asparagus, I’m benefiting from someone else’s endeavors as well as the power of nature. This tree is thriving and full of fruits. Figs are one of my most favourite fruits. So you can imagine that getting a free supply of figs is absolutely fantastic! 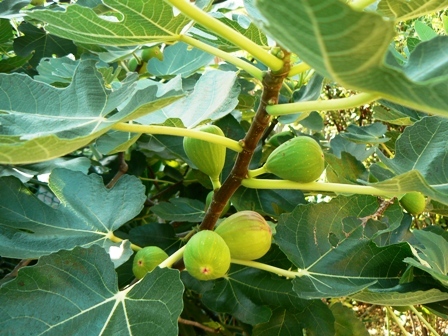 Do you know a fig fruit is actually the flower of the tree? In fact, I was curious what sort of flower the tree would produce. But instead of the flowers, I noticed the little green coloured nubs started appearing on the branches of the tree one day and they grew into fruits. 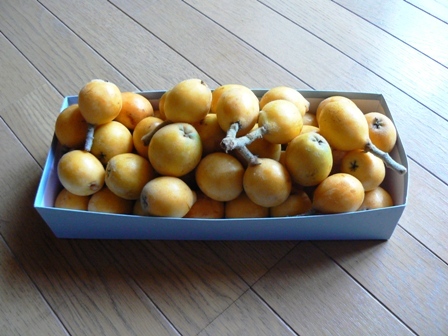 Now I know why the word “fig” in kanji (Chinese characters we use in <?xml:namespace prefix = st1 ns = "urn:schemas-microsoft-com:office:smarttags" />Japan) literally means “a fruit without flower”. 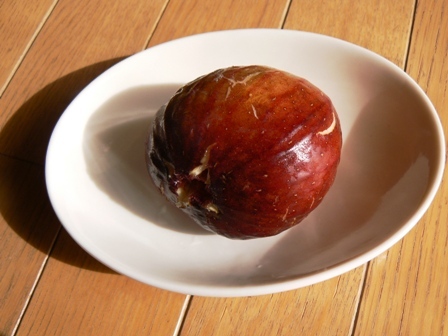 Anyway, I plucked a ripe fig from the tree this morning and it was utterly delicious! 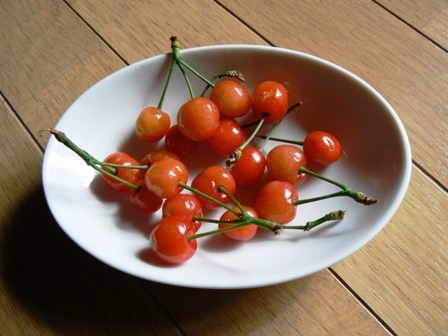 Most of the fruits are not ripe enough at the moment, but they will be soon! I had never been interested in gardening until now. That is to say, I always thought that I didn’t possess green fingers. The front and back gardens of my <?xml:namespace prefix = st1 ns = "urn:schemas-microsoft-com:office:smarttags" />London flat are in wilderness. My husband called it au natural, but they are just unkempt in my opinion. 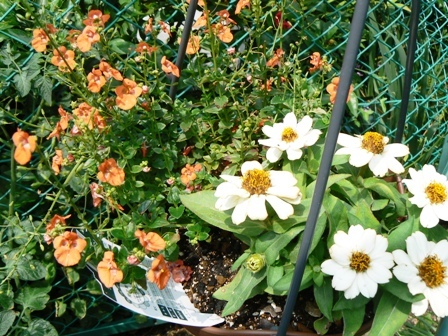 Once or twice I have tried to have an interest in gardening and planted bits and pieces of flowers. They, however, did not survive for long and met with untimely death due to neglect. Hence, I thought gardening wasn’t for me. Amazing thing is that my sentiment towards gardening has a drastic change recently and it is now quite opposite to the one I had before. You would find me happily weeding in my little garden most of the mornings or browsing around in garden centres. What has caused this change, anyway? Well, it’s happened so naturally and I personally can’t pin point the reasons. Most of the people who frequent garden centres are above a certain age, aren’t they? Well, I don’t care whether it is a sign of aging or not! I just love to be in my garden pottering away. It is great to be in touch with nature. To see flowers blossom and trees bear fruits. Against them, yogic teaching of “ahimsa – non violence” goes completely out of the window. Asparagus is one of my most favourite vegetables. They are in season now and readily available at green grocers and supermarkets everywhere. In my case, I don’t need to visit shops as I have asparagus growing in my garden! They are organic to boot! 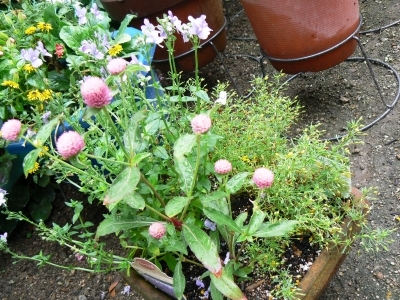 And the best of all, I didn’t plant them, but the previous tenant did. 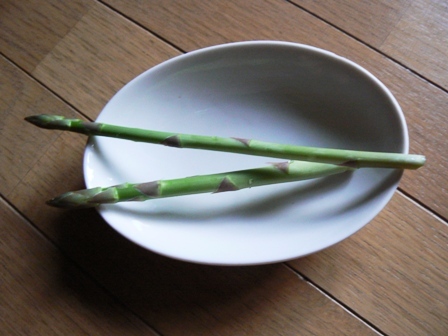 Did you know asparagus shoots up from the ground like bamboo does year after year? I didn’t know this until I found them in my garden. If you let them, they will grow pretty tall, easily over a metre. Then they are unfortunately too tough to eat. Anyway, fresh asparagus is so tender and sweet! No need to cook them. Well, the truth is that I had no interest whatsoever in growing vegetables until now. But after tasting my own asparagus, it has made me realise how wonderful to grow my own vegs. There are many factors attest this. First of all, you know the vegs are completely free of pesticides. Secondly, they taste nothing like the stuff you buy from shops – they taste infinitely sweeter. At the moment, I’m growing cherry tomatoes and some herbs as they are relatively easy to look after – I’m a novice in this after all. Even if you don’t have a garden, you can still grow some vegs in a planter. So why don’t you try to grow your own? Especially if you’ve got kids, show them food does not come from supermarkets!